In an ideal world, money would grow on trees and all bathrooms would be huge. In the real world, many of us need to carve out more space in our small baths without spending big bucks on a complete renovation. One area where you can find those crucial extra inches is at the sink. With a little creative tweaking of sink styles, types of installation, fixtures and cabinetry choices, you can turn a cramped bathroom into a more pleasurable retreat. Sure, you may not be able to wash all your delicates in these sinks, but for daily hand washing and teeth brushing, most of these sinks are more than enough. Small bathroom sinks punch a lot of practical value in smaller, more manageable spaces. Here are six small bathroom sink ideas to consider for your home. 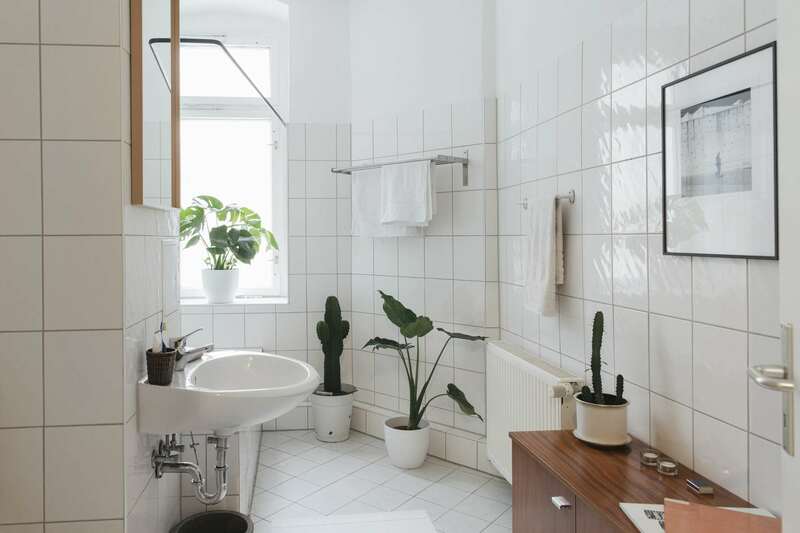 Common in small bathrooms of the 1940s and '50s, the wall-mounted sink's washbowl and plumbing pipes are attached to the wall, freeing up the floor space underneath. It's a great choice for a retro or vintage style bath where the exposed pipes are an integral part of your overall design scheme. Thanks to its good looks and cleverly concealed plumbing, the pedestal sink has been a classic bathroom space saver for over a century. Like a wall-mounted sink, the basin is attached to the wall but also rests on the floor-mounted pedestal. According to the experts at Lowes, installing a pedestal sink can be a bit challenging: you'll need to fit the plumbing inside the pedestal, and also use precise measurements to match the wall level of the sink to the pedestal's exact height. Of course, you'll also give up the storage space of a countertop and vanity. However, recessed medicine cabinets or creative shelving can make up for some of that lost cabinet space. For a really tiny space, you might want to try a corner pedestal sink, which not only adds function but also a huge dose of charm to even the smallest powder room. If you need the extra space that a pedestal or wall-mounted sink provide but simply must have a place to park your toothbrush, a console sink could be your best option. A delicate compromise between zero storage and a room-hogging vanity, a console sink mounts to the wall but is also supported by two to four slender legs. With counter space around the basin and the option of a shelf for extra storage below, this compact sink offers the best of both worlds. Even less-than-petite models can give a small bath the illusion of airiness, thanks to those skinny legs. If your bathroom is 50 square feet or less, you might assume you don't have an inch to spare for cabinetry. The good news is that there are loads of petite and narrow-width vanities that offer both style and surprisingly ample storage. You'll also find a range of downsized corner vanities that take up even less space. While measurements for standard vanity cabinets range from 18 to 21 inches front to back, there are petite models as narrow as 13 inches available in bath showrooms. Home centers also stock scaled-down vanities in as little as 18-inch widths and 16 3/8 inches front to back. Of course, there's always the custom route, but that will be more expensive. Overall, most smaller vanities cost the same — or even more — than what you would pay for a regular model. Here's a super solution for a long, narrow bath used by two or more people: A skinny trough sink with double faucets. Depending upon the materials, it's a look that can be charmingly vintage or coolly modern, like this option by Wetstyle. Last but not least, here's a really small sink option that delivers multiple benefits: a sink retrofitted on top of your toilet. The SinkPositive not only saves floor space but is a win-win for the environment and your wallet. The unit works by re-routing clean water from the toilet's supply line through the hands-free faucet. After you wash your hands, the soapy water then drains directly into the toilet bowl. The manufacturer claims that with normal use, you'll conserve up to two gallons of water per person every day.